If there's a silver lining to the overall decline of computer sales, it's the booming of the premium ultramobile segment. Based on a forecast from Gartner, sales of these slim but powerful flagship systems could rise by 11% this year and, by 2018, account for 27% of PC sales. The key to success in this category is to deliver the most powerful and long-lasting mobile computers in the thinnest and lightest packages. Currently, that could require using Intel's recently introduced Kaby Lake processor family. The new Core processors add additional speed and efficiency to their Skylake predecessors while making 4K graphics run smoother. Among the first Windows PCs to use these seventh-generation Core processors are Acer's Swift 7 and Dell's XPS 13. I spent two weeks with each of these systems, taking them on short trips, to meetings and to the living room for some late-night movie watching. I also ran them through a variety of benchmarks to check performance, battery life, and other factors. Each of these two ultraportables squeeze a lot of power and battery life into impressively lightweight packages. Read on to find out what they're about and which might make a better selection for you. One of the thinnest notebooks around, Acer's Swift 7 sets the standard for those who travel light but need a large, brilliant display. Inside, the Swift 7 has the Kaby Lake-based Intel Core i5-7Y54 processor that ranges in speed from 1.2GHz to 3.2GHz. The 7-watt processor can minutely adjust its performance -- and energy consumption -- to match the task at hand across a 2GHz clock speed range. The laptop includes 8GB of DDR3 RAM, 256GB of SSD storage and a 13.3-in. HD screen. At only 0.4-in. thick, Swift 7 is a marvel of engineering. With an aluminum base, keyboard deck and screen lid, it feels surprisingly solid and sturdy; and the system doesn't bend if you stress its corners. However, like so many other notebooks these days, it feels cold and metallic to the touch -- personally, I prefer the ones with a rubberized coating. In addition, the system weighs an enviable 2.5 lb. ; add in the system's small three-prong power adapter and you have a 2.8-lb. travel weight. On the other hand, the Swift 7 takes up a lot of desk space, measuring 12.7 x 8.9 in., which can be attributed to the 13.3-in. display's wide 0.6-in. frame. I found the color balance of the 1920 x 1080 HD screen to be more vivid and rich than the Dell XPS 13's display, even though it had a brightness level of 268 cd/m2, about 4% less than the XPS 13's display. In an effort to make low-light reading a bit easier (and healthier), the Swift 7 includes Acer's Bluelight Shield, a feature that reduces the level of blue light in the display. Unfortunately, it gives the entire screen a yellow cast which I found unpleasant, especially when looking at images or videos, but it's easy to turn the feature on and off. The display (there is no touch version) uses Intel's Graphics 615 video processor that runs at a top speed of 950Mhz and has 4.158GB of video memory at its disposal. The system's webcam is above the display and can show up to a 1280 x 720 resolution. The Swift 7's rose-gold keyboard deck struck me as a bit kitschy (and unfortunately, it is not backlit), but its 19.3mm keys are supple and responsive. The system's enormous 5.9-in. touch pad is perfect for performing two- or three-finger gestures. While they can get quite loud, the Swift 7's speakers point straight down and, as a result, can sound muffled. The system's Dolby Audio software includes a graphic equalizer that can help compensate by mixing in more mid-range and high-end tones. As far as connections go, the Swift 7 embraces USB-C with a pair of ports, either of which can charge the system; the system also comes with adapters for traditional USB 3.0 devices and connecting with an HDMI display or projector. There's also an audio jack, but no SD card slot. There are built-in Bluetooth 4.0 and 802.11ac Wi-Fi, but the unit lacks the XPS 13's networking amplifiers and prioritization software. A second-generation Trusted Platform Module (TPM) makes remote log-ins more secure. Despite its low-power processor, the Swift 7's performance was within striking distance of the XPS 13. Its PCMark 8 score of 2,796 was 7% less than the XPS 13's score -- but it would be hard to tell the difference between them on raw computing power. Despite not having a fan, the Swift 7 never got hotter than 86 degrees Fahrenheit. Although the Swift 7's 2,770mAh battery is less than half the strength of the XPS 13's, it was able to power the system for 6 hours and 31 minutes -- just 18 minutes short of the XPS 13 -- on PCMark 8's rigorous battery life tests. The system lasted for 8 hours, 43 minutes while playing a series of videos, nearly an hour short of the XPS 13. Acer backs the Swift 7 with a one-year warranty that can be extended to three years for a reasonable $90. At $1,100 (vendor price), the Swift 7 is a bargain for those who want to travel light but not give up the latest mobile technology or a big screen. Short and a little chunky, Dell's XPS 13 is among the smallest notebooks around with a 13-in. display. The system occupies only 12 x 7.9 in. of desktop space, making it roughly the same size as the 11.5 x 8.2-in. HP EliteBook Folio G1, which has a smaller 12.5-in. display. This is probably due to the XPS 13's 0.2-in. screen bezel -- one-third the size of that of the Swift 7. Dell calls this its InfinityEdge display; to me, the thin frame makes the display look like it's suspended in space. The laptop comes with both touch and non-touch displays. The review unit, which costs $1,050 (vendor price), came with a non-touch screen that has a resolution of 1920 x 1080 and a brightness measured at 278 cd/m2; I found it to be less vibrant and rich compared to the Swift 7's screen. If you want something better, you can get the unit with other displays, including an ultra-HD touch display with a 3200 x 1800 resolution that starts at a $1,400 (vendor price). A major compromise of having such a thin bezel is there's no room for the webcam above the display. Instead, the camera is below the screen's lower left corner; as a result, it produced somewhat unflattering video that accentuated my neck, chin and nose. The camera's 1280 x 720 resolution equals that of the Swift 7's better-located cam. The wedge-shaped XPS 13 is 0.4-in. thick in front and 0.6-in. thick in back. It has a robust aluminum case, while the keyboard deck is made of carbon fiber that has an inviting soft coating. The black and rose gold tone of the review unit was, for my taste, overly glitzy -- on the other hand, you can get a plain silver unit for $50 less, which is a win-win for me. The XPS 13 weighs 2.8 lb. ; when you count in its three-prong adapter, the travel weight is 3.1 lb. The review system came with a 15-watt Intel Core i5-7200U CPU that runs between 2.5GHz and 3.1GHz, depending on the task. The model also includes 8GB of DDR3 RAM and a 256GB SSD. It is equipped with Intel's Graphics 620 chip, which runs at 1GHz and has 4.166GB of video RAM at its disposal. With speakers that point outward from its two sides, the XPS 13's audio sounds clearer and richer than the Swift 7's. Because it lacks the software audio enhancements of the Swift 7, though, the audio isn't as customizable. In addition to an SD card slot, the XPS 13 has two traditional USB 3.0 connections, an audio port and a USB-C port that can work with Thunderbolt 3 devices. The system has Rivet Network's Killer 1535 wireless card that combines Bluetooth 4.1 with enhanced 802.11ac Wi-Fi networking. It has two powerful 5GHz amplifiers that can boost the device's range and the ability to prioritize network connections. The XPS 13 comes with a backlit keyboard; however, I found that the 18.9mm keys didn't offer as much space or feedback as the Swift 7's keyboard, and its 4.6-in. touch pad felt more cramped than the large one on the Swift 7. The XPS 13 also includes a Trusted Platform Module (TPM), but it is an older version 1.2 chip compared to the Swift 7's 2.0. The system's PCMark 8 score of 2,990 was 7% ahead of the Swift 7's 2,796 -- a marginal difference that you're not likely to notice. Even under full power, the system only got slightly warm, with a hot spot of 108 degrees Fahrenheit underneath. The XPS is powered by a mammoth 6,090mAh battery that, in our tests, ran for 6 hours and 49 minutes, 18 minutes longer than the Swift 7. It played video continuously for 9 hours, 37 minutes -- nearly an hour longer than the Swift 7. A big bonus is that the XPS 13 has a five-element battery gauge on the side. Just press the button and it tells you how much juice remains. Its one-year warranty can be upped to three years for $189. That's more than twice what Acer charges for the Swift 7's warranty extension. If you can get past the oddly located webcam, the XPS 13 provides a good mix of small size, bright screen and features such as the battery gauge and Thunderbolt 3. It's always hard deciding between two similar systems. In the end, which you choose -- the Dell XPS 13 or Acer Swift 7 -- comes down to how much you value performance, size, and weight. In this class of notebook, every inch and ounce count. While I'm impressed that the XPS 13 squeezes a 13.3-in. system into a case the size of a 12.5-in. system, its thick rear and 2.8-lb. weight are of concern. I love the inclusion of Thunderbolt 3, a backlit keyboard and a physical battery gauge, but its oddly placed webcam is a real setback for me. 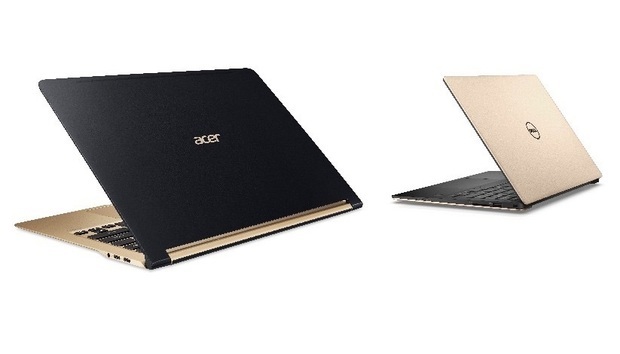 The Acer Swift 7 has a super-thin profile and impressively light weight. It makes the most of the latest processor technology by coming close to the XPS 13 in performance and battery life, but I feel cheated that the Swift 7 has neither ultra-HD nor touch-screen options. However, if forced to choose between them, I'd pick the Swift 7 as a travel companion. It fulfills the Kaby Lake ideal of power on demand without compromising battery life.